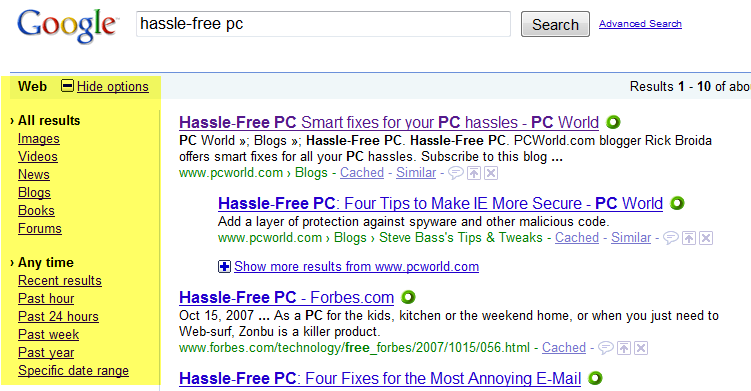 A simple Greasemonkey script makes Google's search-options sidebar appear every time you search. More often than not these days, I find myself clicking Google's Show options link when looking at a page of search results. As you probably know, doing so reveals a handy sidebar with filters like Recent results and Timeline. The thing is, I want that sidebar to appear by default, on every search, so I don't have to click the link every time. If you're a Firefox user like I am, you're in luck: there's an add-on for that. It's called, fittingly enough, Google Always Show Search Options Sidebar/Menu. Actually, it's not a typical Firefox add-on, but rather a simple script file that works with the popular Greasemonkey extension (which you'll need to install first if you don't already have it). After installing the script (by clicking the Install button on the creator's site), just run a Google search like you typically would. Presto: the options sidebar should appear automatically.